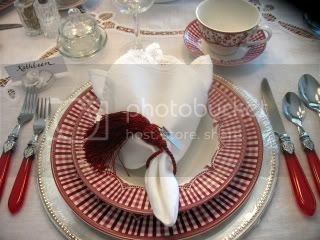 I finally got to do a little table with the red and white dishes from Neiman Marcus via TJMAXX...I found 2 place settings, and called 10 other stores. Finally in one over 80 miles away I found them. My dear dau in law, who has 4 little ones, was kind enough to run over and pick up 4 more place settings for me...she knew I NEEDED them..:) The 3 year old told her to hurry up and get them before someone else did..this child definitely shares my shopping blood! 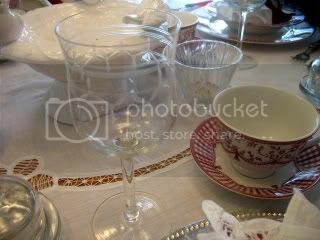 The wine glasses were my mom's, and it you look, it almost looks like the tassel from the plate in the etching. This compote set was a gift from an older couple we met on our honeymoon cruise 38 yrs ago. They came to our house for a visit and brought me this. I love the delicate etchings and curves . They always told the story of the look on my face when I saw we were at a table with everyone over 60...I was in my early 20's! But they were wonderful and we stayed in touch for many years. 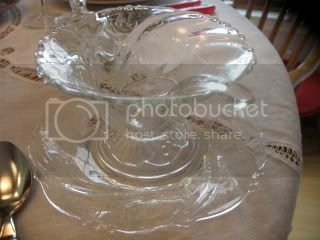 I used this with flowers for the centerpiece..I wanted to float some roses in it, but didn't have any! The silverware is from the very exclusive CTS, (Christmas Tree Shops) :) I have never had any colored silverware..so this is a first. DH never notices anything, but he DID ask where I got it..
My dear gdau is making her First Communion soon, and I will make 50 breads for the guests to take home. Some will be Banana, and others Lemon. So I tried one of the recipes for Lemon.. I am doing the centerpieces too, so my brain is on overtime thinking about what to do.. This is really a beautiful table. 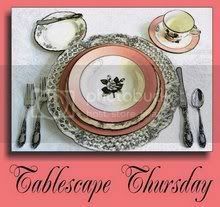 The red and white is sooo pretty and the flatware is great. You made some really good finds! I would love to have one of those lemon cakes - looks delicious! 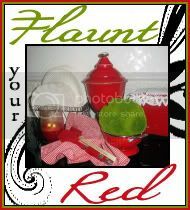 Oh this is a good one, I didn't know about "Flaunt your Red" - did you tell Susan? The dishes are so elegant looking and I am glad that S ran to get you the extra settings. Your mother's glassware does look like it has the tassles. You are the best grandma with all the extra touches you do for the kids big events. 50 breads...amazing. The lemon one does look especially good with the glaze. I'm having palpitations! 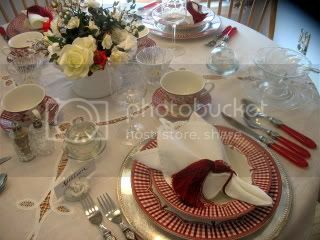 I just love your red tablesetting! I really, really (really) love the flatware from CTS. Your mother's crystal really does look perfect with the dishes. I love those red dishes ... They definitely are worth calling around for ... and even more special that DIL took time from a busy, busy, life to pick them up for you. Oh, Kathleen, I can picture your face being a 20 year-old at a table with no one under 60. How sweet of the couple to give you the beautiful compote. The tablescape is gorgeous as always and am impressed with your great buys. Again, you have a most beautiful tablescape, Kathleen. Wish I had known you were looking for those particular dishes, I just saw them last week and picked up two of the salad/dessert plates. Red oh red. The best color ever. These are the the most wonderful plates. I am running out of room to store plates, but I guess I could get Hub to build me a shelf in the garage hmm. This table looks like it belongs at my house. And the lemon loaves? Straight to my little heart. Kathleen! these dishes are the bomb! I love them. Your mom's goblets are great and I love the tassel napkin ring. Your cakes look so yummy. Love how the glaze finishes them off!! Have fun! 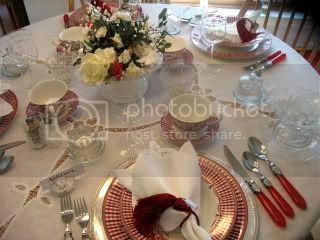 Kathleen - love the red&white dishes and esp. the flatware!! All is put together with perfection! 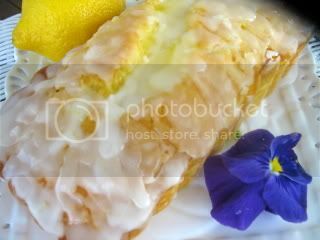 The lemon breads with the glaze and pansy look so beautiful! You are the best gma..this is even over and above what you did for Declan! Beautiful table..and treats.. I know you know I like that setting..:) Beau! A great table -- love the red -- so very pretty! All looks beautiful, Kathleen! I adore those red dishes and have for a long time - lucky you. I haven't been to TJM or Homegoods in over a week and I know they weren't there at that time - I'll see you later, I'm off to shop. Kathleen, BEAU! That is a gorgous tablesetting! Lemon loaves look great. Your table and new china is lovely. I love your centerpiece and container, but what impresses me most is FIFTY lemon loaves! Oh how sweet you are! And how pretty they are! With buys like that at TJ Maxx, I wouldn't complain about expensive thrifts! 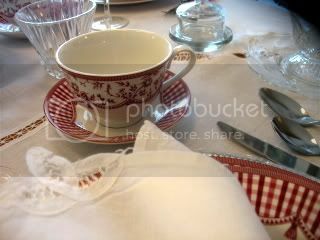 I LOVE that red and white china... it is so very, very pretty. Your whole table is a delight! That table is the best! The dishes...I'm wiggling in my chair just looking at them. I have not seen those at my TJ! I will definitely be on the look out though. Gorgeous! Love the red & white dishes. And the bread looks so yummy. Great tablescape. The centerpiece is lovely too! Come over to my place and check out my reds. Your red dishes are really cute! My, my, that's a lot of eye candy. 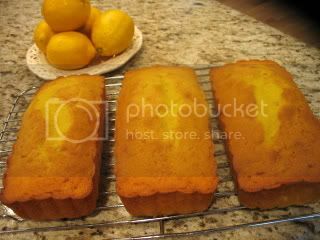 The lemon loaves look scrumptious. My favorite though has to the dishes...gorgeous! I have not seen these. NM has awesome dishes, but they are too pricey for me! Thanks for sharing this beautiful table, food, and especially the RED! Oh my...oh my!! I am so sorry for drooling all over your beautiful table!! Honey, those dishes are adorable and that silver ware is to die for!!! I would had to have bought it too! I like your red plates and those cups too. What a nice couple to bring you a gift. 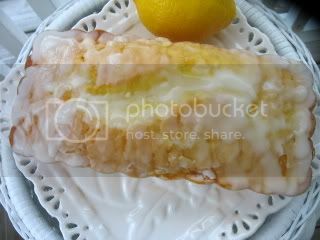 The lemon bread looks great. I made Ina's recipe this AM and this looks just like her recipe. I love that recipe. You sure are making a lot of bread for a nice occasion. Thanks for sharing. Hi Kathleen! I love your table - it's gorgeous! Love your new dishes and all your little extras! You've set a lovely table. Oh, the lemon cakes look divine! I really like the extra touch of the pansy! I love your dishes...they are definitely worth the trouble you went to to find them!!! The check pattern is so sweet and the cup is adorable!!! 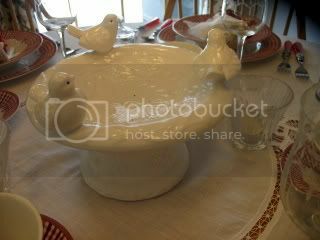 I love the little white bird bath as well...lovely!!! I hope you are having a wonderful RED Friday!!! I love the tea cups. The tassels are a great find for so little. Thanks for sharing. The table is so pretty and the lemon cake looks "to die for". I absolutely love your red dishes! So pretty! That lemon cake looks incredibly yummy! Your table is smashing -- I saw some bits and pieces of the Nieman's dinnerware at our TJMaxx when I was on the hunt for Berry Fields. There were not any whole place settings left. Anything red, and I am in love! I love your red and white dishes. After all, red is my favorite color. What a sweet DIL to go pick those up for you. Your cake looks yummy too. Wow - those dishes are incredibly beautiful. I need to get by TJ Maxx! LOVE your red and white plates....so cute. And the teacup is perfect. Also your lemon glazed bread looks so good!! Love those plates especially your cups! This is a beautiful tablesetting! You scored on those cute butter dishes!! AND those cakes look so scrumptuous! Kathleen, sorry for the late visit, but those are gorgeous! I can't wait to see you use them on more tablescapes!